A shelf system that has no equal: that’s ETAGE. ETAGE has two features: the two or three levels are shaped elegantly to form an oval and, secondly, ETAGE has a wrap-around shell that can be moved vertically between levels. That’s what makes this piece of furniture so special. The supports double as sliders for the shell that can be locked into position with ease. Offering both functionality and rigidity, the shell acts as a sophisticated clampable cover – to obscure and display, as needed. 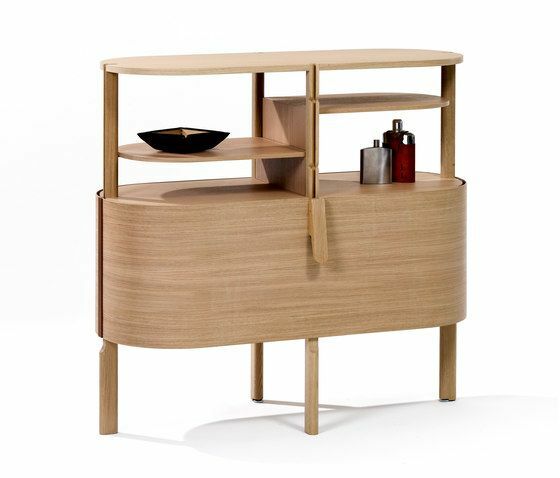 ETAGE is a shelf that can be a type of sideboard plus a bookcase or storage shelf. ETAGE shelf or cabinet furniture item. Frame and BLOC bookends in solid natural oak. Shelves (low or high) and wraparound shell veneered in natural oak. Slider rail in solid arura vermelho wood. Wrap-around shell, shelves and BLOC bookends also available in aubergine-lacquered oak (NCS S 8005-R20B). Elevating screws built into two feet.